We’ll select one photo each week and share them on our social media accounts. Competition opens Wednesday September 28 and closes Sunday 23 October 2016. Winners chosen and announced each Monday during the competition period. Starts 00:01 (AEST), 28 September 2016. Ends 23:59 (AEST), 2 October 2016. Judged 3 October 2016. Starts 00:01 (AEST), 3 October 2016. Ends 23:59 (AEST), 9 October 2016. Judged 10 October 2016. Starts 00:01 (AEST), 10 October 2016. Ends 23:59 (AEST), 16 October 2016. Judged 17 October 2016. Starts 00:01 (AEST), 17 October 2016. Ends 23:59 (AEST), 23 October 2016. Judged 23 October 2016. 6. Only entries submitted via Instagram, Twitter or Facebook and which are appropriately hashtagged and @ mentioned will be accepted. Photographs submitted must be original works. 7.1 The relevance of the submitted photo to the theme in question. 7.2 Artistic interpretation of the theme. 7.3 Originality of the submission. Entries that are deemed to not belong to the user will not be eligible. 8. Judge’s decision is final and no correspondence will be entered into. Prizes cannot be transferred. Non-cash prizes cannot be redeemed for cash. 9. The promoter reserves the right to verify the validity of entries and to disqualify any entry which, in the opinion of promoter, includes objectionable content, profanity, potentially insulting, inflammatory or defamatory statements, disqualify any entrant who tampers with the entry process, who submits an entry that is not in accordance with these terms and conditions of entry or who has, in the opinion of promoter, engaged in conduct in entering the promotion which is fraudulent, misleading, deceptive or generally damaging to the goodwill or reputation of the promotion and/or promoter. The promoter reserves the right to disqualify a winner if the promoter becomes aware that the winner and/or the winner’s entry is of a type described in this clause. 10. Entries must be received within the entry period. The promoter accepts no responsibility for any late, lost or misdirected entries due to technical disruptions, network congestion or for any other reason. 12.1 All images published on Instagram, Twitter and Facebook with #FridaDiegoSyd may be moderated and displayed on the website and social media channels of the Art Gallery of NSW and its associated partners. These images and associated usernames will be public to all. 12.2 By entering the competition and accepting the terms and conditions you agree that you hereby license the rights to use your photo submission to the Art Gallery of NSW and its associated partners on any of its websites or social media channels, or for advertising and promotion of its products, services, and/or its company in any media now known or hereafter developed in perpetuity in exchange for no compensation of any kind. 13.1 By entering the competition and accepting the terms and conditions, you agree that the Art Gallery of NSW may use your personal details for the purpose of conducting the competition, including the use of your Instagram name in promotional formats. 13.2 By entering the competition, you give the Art Gallery of NSW permission to contact you via Instagram, Twitter and Facebook if you are a winner of the competition for the purpose of distributing your prize to you. 14. The promoter reserves the right to request winners to provide proof of identity and proof of residency at the nominated prize delivery address. Identification considered suitable for verification is at the discretion of the promoter. 16. The promoter shall endeavour to contact the winners via their Instagram, Twitter or Facebook account within one day of the prize judging. In the event that the winner/s cannot be contacted after one month, an alternate winner will be selected and the original winner will forfeit any prize. The unclaimed prize judging will take place on Monday 28 November 2016 at the Art Gallery of NSW. 18. The promoter is not responsible for any incorrect or inaccurate information, either caused by the phone user or for any of the equipment or programming associated with or utilised in this competition, or for any technical error, or any combination thereof that may occur in the course of the administration of this competition including any omission, interruption, deletion, defect, delay in operation or transmission, communications line or satellite network failure, theft or destruction or unauthorised access to or alteration of entries. 19. If for any reason this competition is not capable of running as planned, including due to infection by computer virus, bugs, tampering, unauthorised intervention, fraud, technical failures or any causes beyond the control of the promoter, which corrupt or affect the administration, security, fairness or integrity or proper conduct of this promotion, the promoter reserves the right in its sole discretion to disqualify any individual who tampers with the entry process, take any action that may be available, and to cancel, terminate, modify or suspend the competition, subject to any written direction given under state regulation. 20. 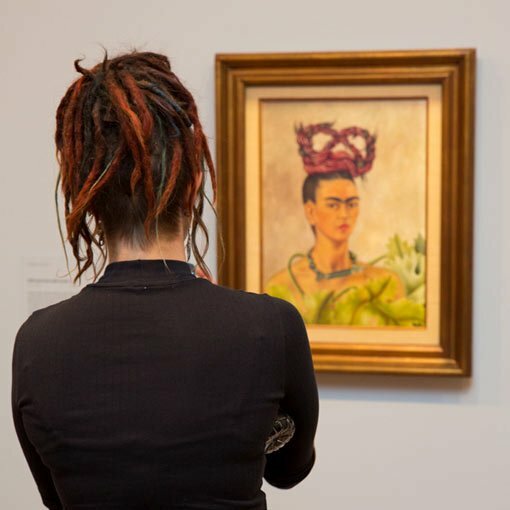 There are four prizes (one per entry period) consisting of a selection of Frida Kahlo and Diego Rivera exhibition merchandise from the Gallery Shop valued at $164. 21. In the event that for any reason whatsoever a winner does not take an element of the prize at the time stipulated by the promoter then that element of the prize will be forfeited by the winner and cash will not be awarded in lieu of that element of the prize.